Have you ever found yourself in an unfamiliar place? Maybe you were traveling for business or a vacation, road tripping with your friends, or moving into a new city. Chances are you don’t know where anything is; where to eat, what to do, or how to meet the locals. Wasting all of your time surfing the web or searching for a map to find your way around can be time consuming. How convenient would it be if all this information was accessible on the fly? Our Capstone team has taken on the bold task of creating an application called Glass Guide for Glass, the new and exciting wearable device from Google. Our app aims at taking out the guessing game when it comes to finding fun things to do in downtown Athens. Whether you want to hear a concert, get something to eat, grab a drink, or shop for new clothes, Glass Guide will have you covered. 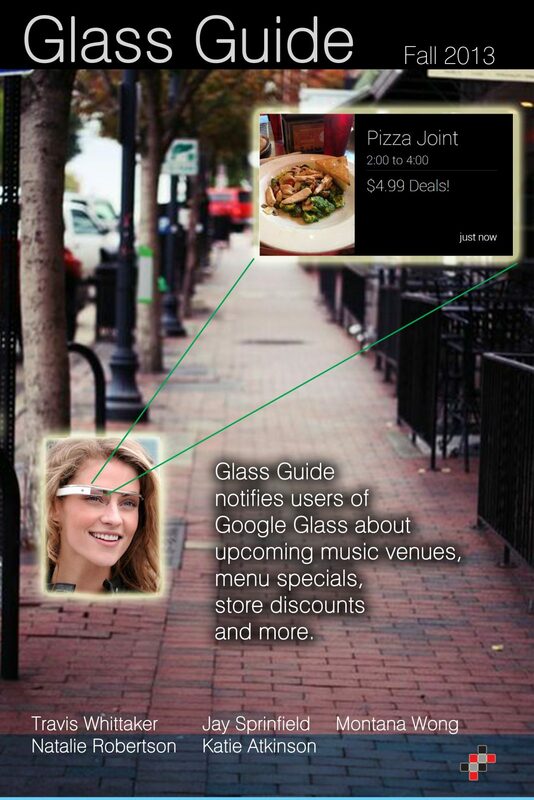 Glass Guide keeps you, the Google Glass user, up to date on what is going on at all of the businesses in downtown Athens. 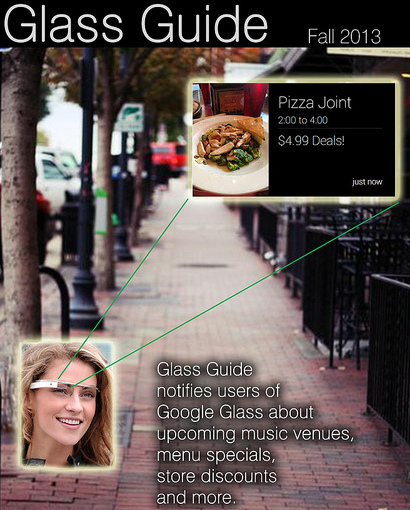 All you have to do is open Glass Guide, walk up to a business, let Google Glass receive a Bluetooth signal from the business, and Glass Guide will prompt you to view information about what the business has to offer. The information provided includes specials from restaurants, upcoming events at the music venues, and deals going on at the local shops. The most exciting part of the project is that Glass Guide can easily be expanded. If the application proves to be a success, our team could create databases for other major metropolitan areas throughout the country. Today, Glass Guide can help make the beautiful city of Athens yours. Tomorrow, it could be Boston, New York, Atlanta, Washington D.C., San Francisco, and more.